Davidson Contemporary presents a solo exhibition of the works by Chris Papa. Like many print artists working today, Chris Papa is drawn to the challenge of making contemporary art in what is considered by many to be an anachronistic medium. Papa works primarily with woodcut for several reasons. It provides him with a way to combine the physicality of sculpture with the graphic qualities of drawing. 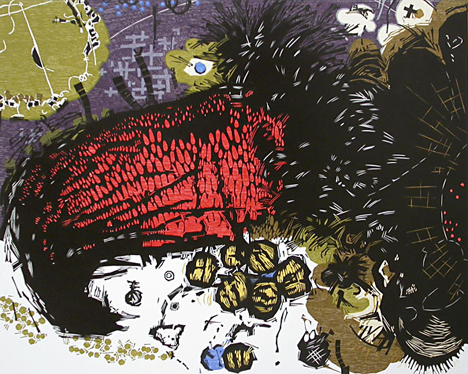 The woodcut reveals in an explicit, visceral manner the process of carving, inking and printing that is used in its creation. And, it has an intrinsic affinity for abstraction that contrasts its use in representational artwork.